Of an estimated 220,000 individuals who’ve been associated with Boston College as faculty, staff, administrators, and students since 1863, a handful have significantly altered the institution’s course. A very few, such as Thomas Gasson, SJ, who brought Boston College out to Chestnut Hill in 1913, or Mrs. Vincent P. (Mary) Roberts, who as head of the Philomatheia Club—the women’s Boston College support group—virtually led Boston College fundraising for the first half of the 20th century, may have known, or believed they knew, what they had wrought. Most, though, like the six students who in 1919 founded the Heights or the administrators who in 1938 formed a College of Business Administration, were simply doing what they wanted to do or were asked to do. 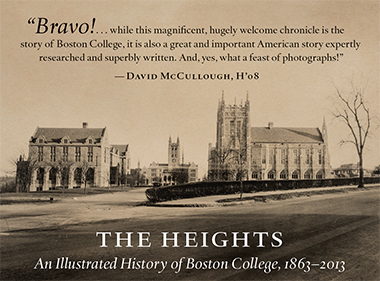 As part of its year-long commemoration of the Sesquicentennial, Boston College Magazine offers portraits of some of those who in our own time, by diligence and imagination, endurance and patience, drive and sheer good fortune, turned Boston College in directions once unforeseen but now foundational. 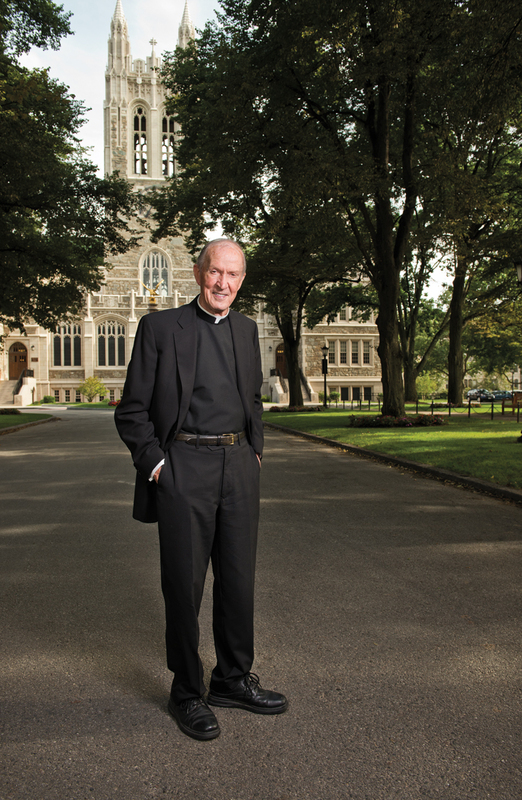 J. Donald Monan, SJ, is the longest-serving president in the history of Boston College, having led the University from 1972 to 1996 before becoming chancellor. A philosopher whose father was a railroad worker in upstate New York, Monan led Boston College out of financial and morale crises serious enough that they were judged to threaten the University’s existence. (The campus, it was at one point rumored, would be turned over to Boston State College, now UMass-Boston.) During his 24-year tenure, Monan established financial and academic planning systems, oversaw the construction of 15 academic, residence, and other buildings and the acquisition of 16 more, including those on the 40-acre Newton Campus. He also presided over an increase in the annual budget from $34.4 million to $339.8 million and an increase in the endowment from $6 million to $600 million. He was photographed on August 7 on Linden Lane. From its beginnings the University was, according to its bylaws, a corporation owned and operated by a small board of Jesuits, who were themselves selected by local Jesuit leadership and officials in Rome. In 1968, reflecting the Second Vatican Council’s push for greater lay involvement in the Church and its institutions (and following the lead of other U.S. Catholic colleges), the University established two boards. One was a Jesuit board of trustees invested with “paramount legal authority” (e.g., fiscal control and votes that counted), and the other was a combined Jesuit and lay board of directors that oversaw day-to-day operations, including educational policy. In November 1972, they were conjoined, and full legal responsibility for Boston College was transferred from the Society of Jesus to lay men and women and non-Catholics, in addition to Jesuits. 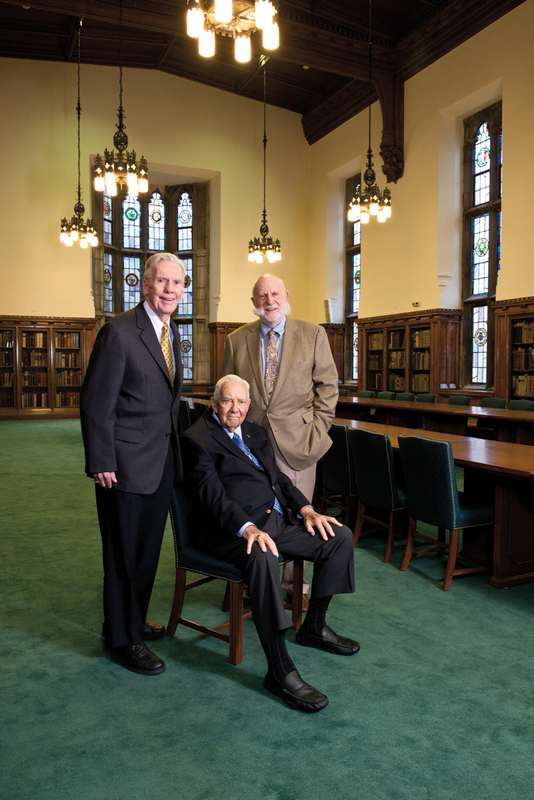 The 1972 board of trustees had 20 laymen, two laywomen, and 13 Jesuits, including (from left): Joseph F. Cotter ’49, who was then executive vice president of ITT Sheraton; Giles E. Mosher ’55, who was vice-chairman of BankBoston; and Avram Goldberg, then the CEO of the Stop & Shop Supermarket Company. Describing the board’s early days, Mosher says, “The big issue was bankruptcy. . . . We never got by that for a year or two.” They were photographed on June 13 in the Burns Library Trustees’ Boardroom. Their own meetings took placed in McElroy Commons. Boston College did not hire women faculty until 1928, did not appoint a female dean until 1944 (Dorothy Book, School of Social Work), and did not tenure a woman faculty member until 1959, when Alice Bourneuf, an economist, was brought to Boston College from the University of California, Berkeley, with instructions to build a department. Today, of the roughly 1,300 individuals who hold managerial administrative posts at Boston College, 48.6 percent are women. 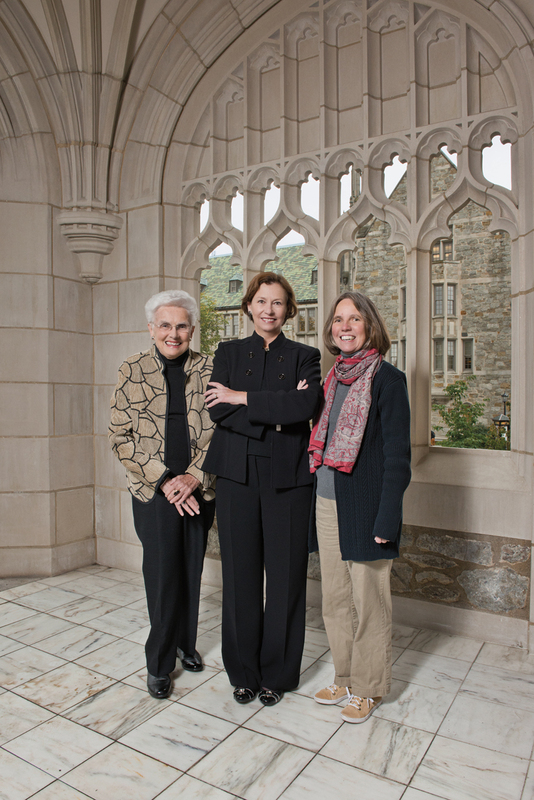 Pictured, from left, are Margaret A. Dwyer M.Ed.’56, H’98, who in 1975 was appointed the University’s first female vice president; Mary Lou DeLong NC’71, currently vice president and University Secretary, who was named vice president for university relations in 1992, the first woman to lead an administrative division; and Louise Lonabocker ’74, M.Ed.’76, Ph.D.’81, who began her career at Boston College in 1970 as support staff in undergraduate admission, has held positions as program director for transfer admissions and associate dean for enrollment management and University registrar, and is currently executive director of student services. They were photographed under the eastern portico of Gasson Hall on October 12. 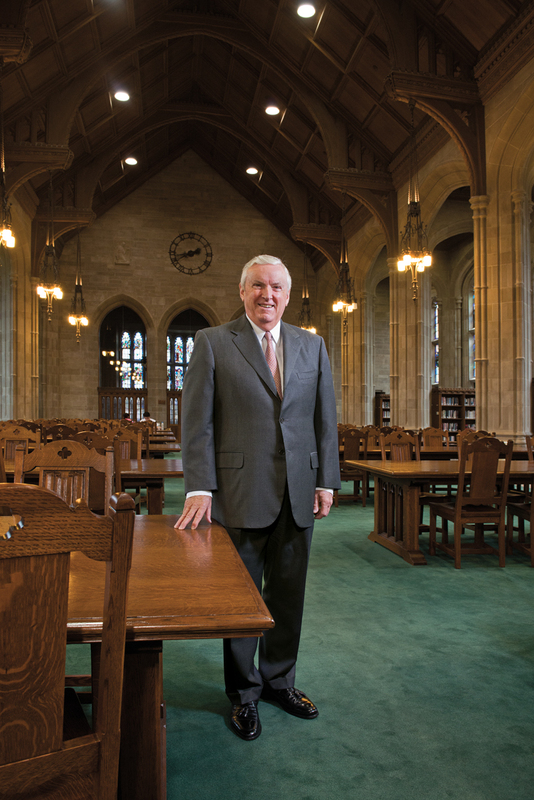 In 1973, with Boston College facing declining applicant demographics and increasing numbers of early withdrawals, Jack Maguire ’61, Ph.D’66, was asked to form a new Office of Admissions. An assistant professor of physics, Maguire brought science (i.e., quantitative research and hard thinking) to what had previously been an intuitive, chaotic, old-boy business, and united the functions of recruiting, enrolling, supplying financial aid, and tracking and retaining students. He called what he was doing “enrollment management,” which became the industry’s term of art (and the tag assigned to offices today at hundreds of American colleges). In the 10 years that followed (Maguire departed in 1983 to form his own consulting firm), applications to Boston College rose by 48 percent to 12,414, and the graduation rate reached 85 percent, establishing a trajectory that leads directly to the record 34,090 applications for the Class of 2016 and a “most selective” designation in the current (and in many previous) U.S. News and World Report rankings. 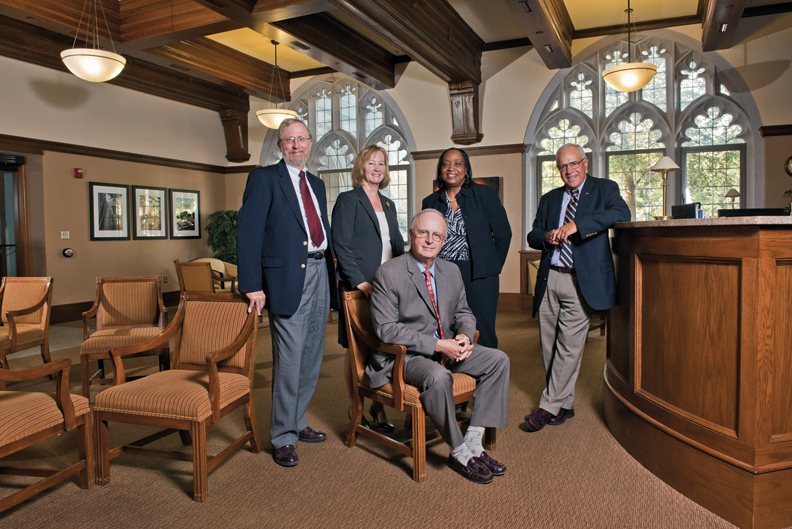 Photographed in the Office of Undergraduate Admission, Devlin Hall, on September 11 are members of the first enrollment management staff (from left): Robert Lay, then director of enrollment research and now dean of enrollment management; Patricia Casey ’75, M.Ed.’81, then associate director of admissions and today senior vice president at Maguire Associates; Jack Maguire, CEO of Maguire Associates; Louise Hannah, who recently retired as support services supervisor in the Office of Undergraduate Admission; and Reid Oslin ’68, GSSW’71, then assistant director of admission and recently retired from the University’s Office of News and Public Affairs. No one seems to know when the first African-American student enrolled at Boston College, such recordkeeping likely being deemed unimportant prior to the advent of affirmative action. Certainly the numbers were very small, and they remained so until 1968 when the University, which then counted 13 African-Americans among its 6,975 undergraduates, like many other universities came under civic (and religious, in the case of Boston College) pressure to make a concerted effort at racial inclusion. Using scholarships offered through what it called the Black Talent Program, the University enrolled between 34 and 48 (accounts vary) new black students in the fall of 1968. During the 2011–12 academic year, by contrast, 406 members of the undergraduate student body—5.1 percent—were of African-American descent, and the number reporting African-American, Hispanic, Asian, or Native American heritage was 2,289—that is, 28.8 percent. Among the earliest leaders of the African-American community at Boston College were Howard McLendon ’75 (left), an American Baptist minister, who was recruited by Black Talent and oversaw the program while still an undergraduate, and who returned to the campus in 1992 as Interfaith Campus Minister, overseeing 11 student groups, including the Buddhism Club, the Muslim Student Association, and the Episcopal Eagles; Sylvia Simmons, M.Ed.’62, Ph.D.’90, H’11 (center), who in 1966 was named registrar of the School of Management, becoming the University’s first female African-American administrator, and who has been a University trustee (1990–98) and a trustee associate (1998—present); and Wayne Budd ’63 (right), senior counsel, Goodwin Proctor, LLC, who was a member of the University’s Board of Trustees between 1980 and 1997, and has been a trustee associate since. 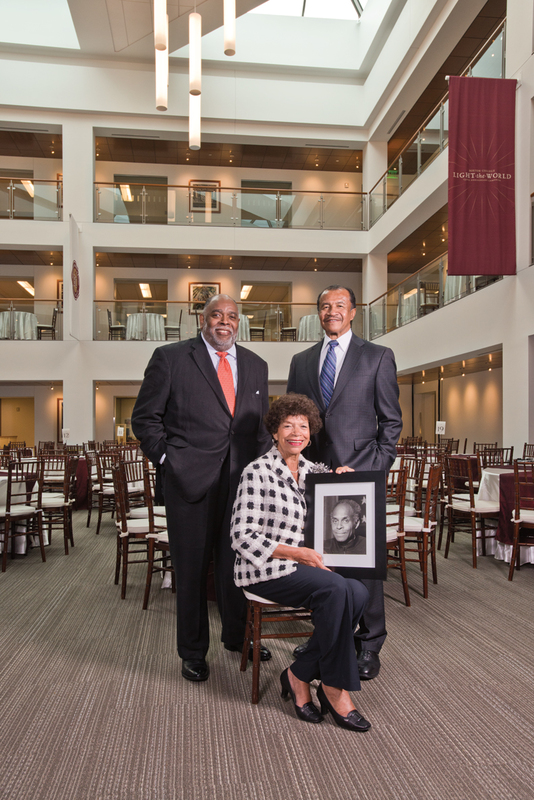 Simmons holds a photograph of David Nelson ’57, JD’60, H’79, the first African-American judge to sit on the United States District Court for the District of Massachusetts and the first African-American to be appointed a member of the Boston College Board of Trustees, serving from 1972 to 1995 and chairing the group between 1984 and 1987. In 1995, the University created an endowed chair (currently bestowed on a professor at the Lynch School of Education) in his honor. He died in 1998. The photograph was taken in the Cadigan Alumni Center on June 29. 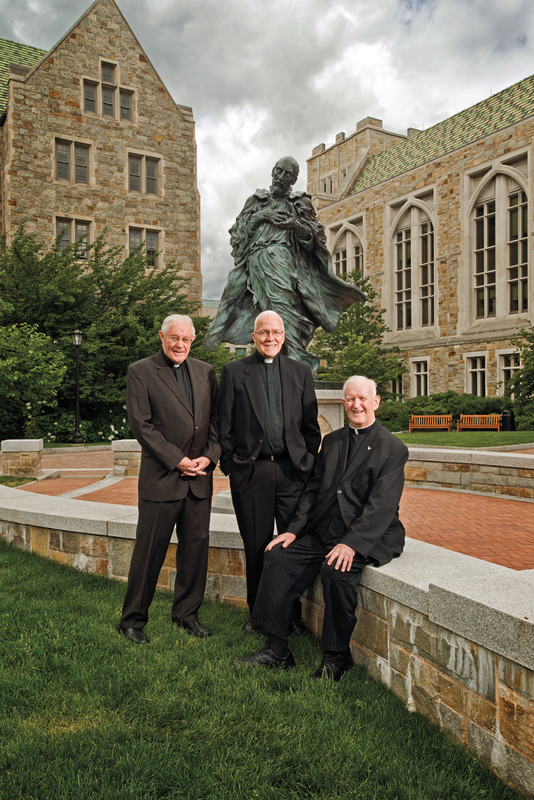 The three Jesuit priests in the photograph have worked a combined 120 years at Boston College. James Woods, SJ, ’54, M.A.T.’61, S.T.B.’62 (right) joined the University in 1968 as dean of the Evening College, which at his urging became the College of Advancing Studies in 1996. In May 2002, with a gift from Katharine B. and Robert M. Devlin honoring his service, the school was renamed the Woods College of Advancing Studies. After 44 years, Fr. Woods stepped down as dean in May 2012. Joseph Appleyard, SJ, ’53, S.T.M.’58, H’12 (center) started his career in 1967 as a member of the English faculty. Beginning in 1987, he was for 10 years director of the Arts and Sciences Honors Program before being appointed founding vice president of the Office of Mission and Ministry, a post he held until 2010, when he was asked to take a senior administrative position with the New England Province of Jesuits. William Neenan, SJ (left), an urban economist, arrived from the University of Michigan in 1979 as the University’s first Thomas I. Gasson, SJ, Professor. From 1980 to 1987 he served as dean of the College of Arts and Sciences, before becoming academic vice president and dean of faculties. Since 1998 he has been vice president and special assistant to the president. He has presided at 225 Boston College-related marriages. The three were photographed June 27 in front of the statue of St. Ignatius on the Higgins lawn. A son of Boston’s Roslindale neighborhood, Jack Connors, Jr. ’63, H’07, was a “day-hop” at Boston College, earning his tuition selling hot dogs at Fenway and driving a taxi. After graduating he did a brief stint in the military, sold TV dinners to supermarkets in New York City, and then joined BBDO, where his work on the Dodge account threatened to land him a promotion to Detroit—”a life sentence,” he recalls. Fleeing to Boston with his wife, Eileen ’66, MSW’95, in 1968, he cofounded Hill, Holliday, Connors, Cosmopulos Inc., an advertising agency that he led for 38 years, serving as chief relationship builder and rainmaker. HHCC was among the 20 largest agencies in the country when he retired in December 2006 to run a family philanthropic foundation. Connors’s charm, intelligence, and tenacious practicality gained him not only accounts but also appointments to the boards of the Boston Ballet, Wang Center for Performing Arts, Brandeis University, Harvard Medical School, and Partners HealthCare, which he chaired for 16 years. He has been a University trustee for 33 years (six as chairman), a record not under threat. Viewed by many as the quintessential “Boston College man” (an early 20th-century phrasing), Connors is more significantly a link that holds old BC and old Boston and what has replaced them in graceful tension. He was photographed on October 2 in Gargan Hall, Bapst Library. Early in the 1970s, a group of young chemistry faculty trapped among the mullioned windows and sloped ceilings and leaky drains in the upper reaches of Devlin Hall (a 1924 science structure), began to importune the University for doctoral and post-doc students, equipment, and time away from teaching for grant-worthy research. Obstinate and energetic (and, for the most part, endearing), they convinced Boston College to solicit a review of the department by nationally respected scientists. The four-person review concluded (as the faculty knew it would) that the chemists’ complaints were meritorious, and that ambition and talent (and Boston College’s reputation) risked being harmed by the weight of the handicaps the department faced. Boston College proffered resources and, a decade on, in 1985, a departmental report noted that grant revenues had quadrupled to $1.1 million, and publications per year had doubled to 35. 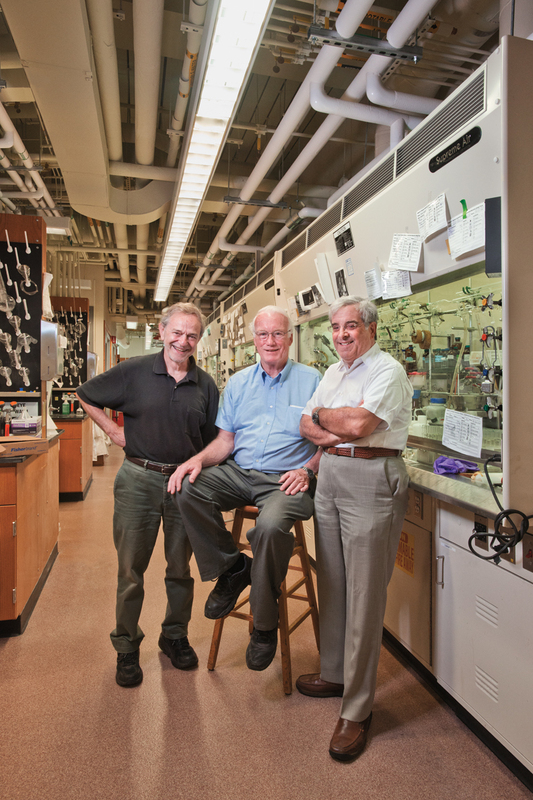 In 1991, the 109,000-square-foot Merkert Chemistry Center opened, the first and, to date, the only campus building given over to a single department. Among the young Turks who moved, unbidden, to radically change Boston College’s approach to science—an alteration that has since been effected by newer generations of faculty in the departments of physics, biology, psychology, mathematics, and earth and environmental sciences—were, from left, professors Paul Davidovits (who began at Boston College in 1974), Thomas A. and Margaret A. Vanderslice Professor of Chemistry T. Ross Kelly (1969), and Evan Kantrowitz (1977). They were photographed July 18 in Merkert 311. On New Year’s Day, 1940, the Boston College football team played in its first bowl game since before the turn of the century, losing to Clemson in the Cotton Bowl Classic, 6–3. The following year, the Eagles took on Tennessee in the Sugar Bowl and won 19–13. Two years later, in 1943, they played Alabama in the Orange Bowl, losing 37–21. It would be 40 years before the Eagles, led by quarterback Doug Flutie ’85, would return to postseason action—in the 1982 Tangerine Bowl, followed by the 1983 Liberty Bowl, followed in 1985 by a return to the Cotton Bowl, in which the Eagles defeated the University of Houston 45–28 for their first post-season win in 44 years. Since then, over nearly three decades, the football team has made 16 bowl appearances, including eight consecutive wins beginning in 2000; and the expectation that Boston College would participate in a post-season bowl replaced the conviction—which had virtually ruled for eight decades—that they would not. 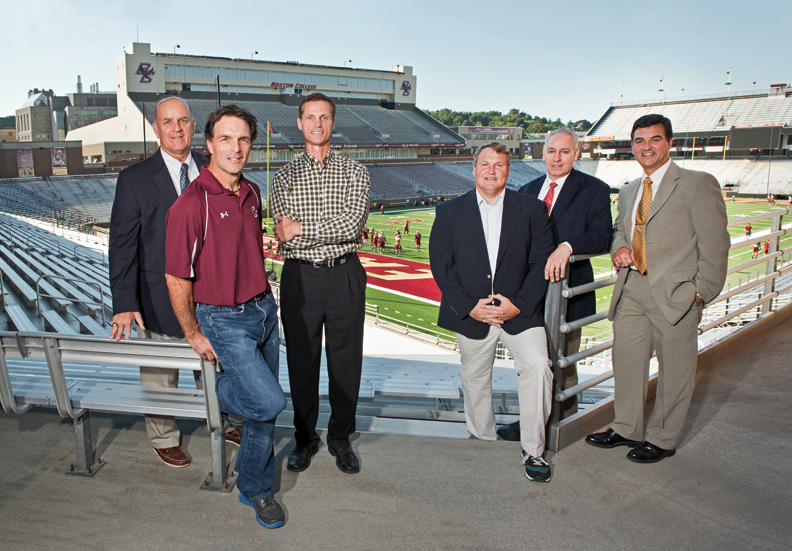 Members of the Cotton Bowl team that changed everything, photographed in Alumni Stadium on September 13, included (from left): Barry Gallup ’69, Boston College associate athletic director for football operations, who as a coach awarded Doug Flutie the team’s last scholarship for 1981; Flutie, college football analyst, NBC Sports; Gerard Phelan ’85, senior vice president, RR Donnelley; Peter Holey ’85, commanding officer, vice unit, Lynn, Massachusetts, police department; Ted Gaffney ’86, MBA’88, president, Beacon Rail Leasing, Inc.; and Kevin Snow ’85, principal software engineer, SimpliVity Corporation.